Five minutes after the vending machine went up, the line was nearly across the Atrium of the Student Union. However, students weren’t lined up for snacks. They were waiting for free Wright State T-shirts and hats. The vending machine, supplied by 2007 Wright State graduate Jeff Thibodeau and his company, Innovative Vending Solutions, dispenses gear for free. Companies and organizations around the country have used the vending machines to gain followers on social media and create a buzz about their products and services. 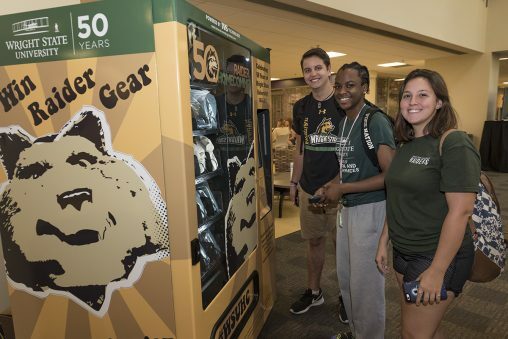 To receive a hat or shirt, Wright State students had to post a photo of themselves with the machine on either Twitter or Instagram along with the hashtags #WSUHC and #Raiderup. Hundreds of posts flooded Twitter and Instagram as students posed for their free gear. The machine was available Sept. 27 and 28 during Homecoming Week. It will also be operating during the Homecoming Festival on Saturday, Sept. 30, so students and alumni will have plenty of time to get Wright State gear. The festival takes place from 4:30 to 7 p.m. in the Rinzler Student Sports Complex Parking Lot. “It only takes a few minutes, so no excuses,” said Miranda Fryman, a senior marketing major and social media coordinator in the Office of Marketing. Katie Halberg, director of social media, provided students with instructions on how to use the machine handed out fliers promoting Homecoming events. For Halberg, it was an opportunity to get students excited about Homecoming Week and the vending machine, which is the first to make an appearance on a college campus in the region. Students showed a very positive reaction to the vending machine. 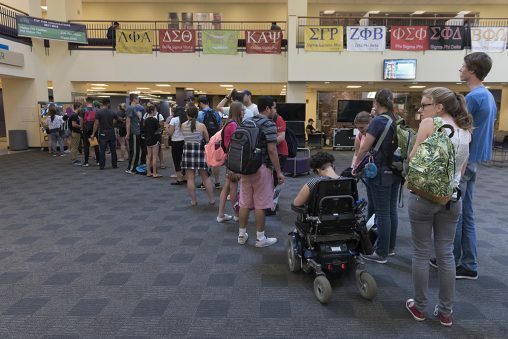 So much so that by 4 p.m. on Wednesday, students were still waiting in line, an hour after the giveaway was originally scheduled to conclude. Halberg estimated that 600 items were given away during the first two days of the promotion.